Our old dunny was down the back and built in bricky union with the Chappies. The dividing fence separating our estates ran smack between the two feet that separated our privy doors. Our cisterns rarely chimed in unison because it was part of the game that one did not hear the grunts of labour of the sighs moanings of ecstasy of the unseen partner. It was a Chappie Man I liked most to be in residence with his noisome pipes somehow seemed to catharsize the often turgid atmosphere of the backyard villa. There were always plenty of matches to be lit whilst he went through the Sydney Morning Herald and an ounce of Old Plug. Sometimes we’d have all been down the back and perhaps even washed-up before the blue smoke from his curly pipe would cease leaking through the roof and the fiscus. He had to wear his glasses down there for even with a house brick propping the door open there was not overmuch light. Of course there was always a candle to help out on really dark mornings. The candle was always an inch long and festooned with drippings which froze the curled and blackened matches in old enamelled holder. I can’t remember what other type of pipe-side literature Chappies Man indulged in during those secret hours. The dividing fence could not have been more than twelve feet long. It stuck out like a row of toothpicks from the gloomy dentures of our wash-house which housed the sadly worn wringer whose perished middle was stop-gapped with an old trouser leg and half a tea towel. Fifty years ago the handle of this wringer was propelled by a quarter horsepower boy with singularly little grace. This fence wasn’t much in the way of fences even for those days. It was very grey and most of the nails which upheld the privacy between 290 and 292 were museum pieces of iron oxide. The moistest thing about the fence apart from its age and decrepitude was the fiscus which supported it. This vine had gone berserk and its branches were closing up the lavatory door. It crept its long cancers through the vents and dropped the obscenity of its figs beneath my feet that could not touch the floor when I was enthroned. Our W.C. was a somewhat more elegant than the Chappies’. Beautifully shaped cobwebs, neatly cut squares of the “Herald” strung on the door and oleographed reproductions of Sir John Millais’ “Cherry Ripe” and “Bubbles” set off the rest of the furnishings. Occasionally we’d switch and have squares of the “World’s News” and I was constantly amazed by the odd and scarcely credible information it provided before it met its predestined end. Despite the artwork our lav was never in the first flight of mod. cons. It was adequate for the traffic (since we were invariably constipated), and could most aptly be described as a high-up suite with cultural asides. As I said, one pretended not to be in there at all when the neighbours were puffing and blowing in the semi-detached. I could hold my peace when the Misses Chapman were in possession, but could not abide the long and wearisome wait for Chappie Man to complete the “Herald” and his movements. I used to pull the chain and to Hell with it! Apart from reporting my getting bitten on THE MUST’NT TOUCH IT by a harmless spider, and big brother dropping his fountain pen in to the gurgling depths, I have nothing more to add to on the evacuatory life and habits of 290. 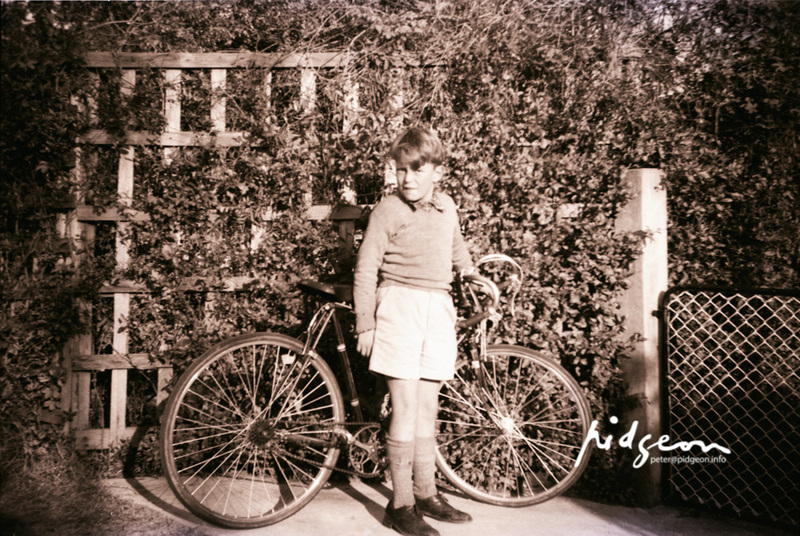 Bill Pidgeon (Wep) aged 9, in the backyard of 290 Glenmore Rd, Paddington, 1918. I can’t remember if I ever told you about the Chappies who lived next to us. Chappies were there when I was born in 290 and were there when I left to get married. At least two of the Chappie’s were, that is, Big Chappie and Little Chappie. In my childish days there were three Chappies, the one with the moustache being Chappie Man. He drank out of a very special cup which helped, but not quite, to keep his whiskers out of his tea. He was the only adult male in the whole of our spinster and widow-ridden terrace. Somehow this distinguished association with such a celibate company seems to suit him – it was hard to conceive even in a child’s imagination his lusting after tender virginhood. He looked like a senior walrus and one could not imagine him in any occupation save grunting and wallowing in the Behring Sea, but was most probably, full of the social graces. Chappies were always very kind to me. They were lonely people who did not have many visitors, mad or otherwise. They were used to my screechings and juvenile friendship. By their standards, I suppose my mother was a real go-out. Sometimes they would be baby-sitters for me – although in those days one just looked after, or minded, a small child. It was always a great treat to be looked after by the Chappies. No matter how much food I had consumed at home I could always go their rock cakes and hop beer. After the goodies and whilst they were madly knitting booties and bonnets for sale at Farmer’s, I would be allowed to pound, with all stops out, on their old foot-bellowed organ. Chappies would occasionally drop a stitch but would forgive my ignorance of Bach, or Palestrina, and applaud my Stravinsky sounds even though they had not yet been written. I suppose it was this sort of mod dissonance, and sheer magnitude of noise which started me off on my first abstract nightmares which haunted me when I had finally been rugged up and settled down on their settee. Oh dear! Those crazy interlocking and ever-expanding circles! They engulfed and terrified me in their cosmic inhumanity. A commonplace enough vision of the world now, but real crook in Paddo in 1916. In March 1906, Mary Ann Chapman nee Nottage (1838-1906), relict of Albert died at 292 Glenmore Road. Albert and Mary were the parents of Edgar, Florence and Mary. In the 1903-04 Electoral Roll, Edgar Nottage was at 226 Glenmore Road, Paddington. Spinsters, Florence and Mary were not recorded as they were ineligible to vote at that time. In the 1913 Electoral Roll, Edgar Nottage Chapman, clerk, 292 Glenmore Road and sisters, Florence Mary (1862-1944) and Minnie Emma (1873-1945) (home duties) were recorded at 292 Glenmore Road. Edgar died May 1920. In 1933, the year of Wep’s marriage, only Florence and Minnie Chapman were recorded at 292 Glenmore Road and again in 1936 but gone by 1937. This butcher fellow was only an employee in one of the two butcher shops in Five Ways. He was very very helpful. If I asked for a set of brains of a sheep (or perhaps of an idiot) I got them always large and soggy. He was about as obscure with his dirty jokes as the people I know now. Uncle Harry had a bag full of meat – a Gladstone bag full – not of good quality but still meat. It was 1917 sometime, Uncle Percy had been killed in France (1). Perhaps only Grandpa White. The kids needed meat, otherwise Uncle Harry would hardly have gone to all those shenanigans to get it. He got around saying little against the Railway strikes. He said little against anybody. I suppose that’s how he got it. Meat was hard to come by. Possibly he was the only pink in the white White household. True Blue rinsed White our family, circumspect and unquestioning, we ate the red red meat. It’s not much good trying to tell you what a butcher was like in the bad old days and just after I started running messages for two families for a penny a day, I got to recognise meat when I saw it. Dead that is; and off a lawfully killed scrub goat or bobby calf. Uncle Percy, did I mention Uncle Percy? No, it was Uncle Harry, he was the longest thinnest one of all. You never knew, anyway, any of them. Harry or Percy, Uncle for sure, had, round about nineteen sixteen or seventeen, a work bag one day, full of meat. Quite full, enough to do all the White family a meal, and there were plenty of Whites in Paddo then. Modern social science calls for an extended practical education, but one peep in that old Gladstone taught me one aspect of it for life. Never had I imagined that such seemingly warm and jovial people as my uninhibited relations were, could be sustained by those unpalatable and revolting slabs of meat – perhaps it was the meat strike which had affected their discrimination. Afterwards I took much notice of the old butch shops. It might seem Dickensian to you but they were a source of wonder and colour in my youth. A butcher really butchered in those days. The shop meat and fat, blood, sawdust ferns, running water down the windows, lights (or lungs to you) in buckets, livers on hooks, brains in the head, tails in the hair, yards of sausage gut skin, smiles, plastered down hair and credit too. None of your prefabricated T-bone steak or short loin chop which extends from tail to neck. No plastics – no prices. Percy Rowett White enlisted 5 Sep 1916. He died from wounds, 24 April 1918 at Amiens, France. Five Ways to Remember: B.P. – L.H. There it was. Irrevocably stated in juvenile chalk marks on the fence in Lawson Lane. Flanked on the right by a swung decrepit gate, and on the left by a battered dirt-box, (or garbage tin). Was this ultimate truth? Within an ill-drawn heart was emblazoned the legend that B.P. luvs L.H. It was quite true. Lois had the moistest. Although young, she knew how to cast a glance. I had determined to be a Sir Galahad to her, and if she had wished to walk down to Rushcutters Bay across the Chinamen’s gardens, I would have escorted her; and I had hoped defended her against such assaults as were common among the lecherous young in those days. I envisaged myself fighting off all the bikies, the “onion mob” and all. Not that bikies as such existed in those days, but they had their progenitors. I had not chalked up that soft affection in Lawson lane. I did, God forgive me, repeat the message on Sharkey’s fence in Hoddle Street. I liked it be known that L.H. was loved. Years later when I was under the shower, I used to think fondly of the girl who parents inconsiderately moved to Bexley or the bush. Other boys seemed not to be troubled with tender scruples relative to maidenhood. Occasionally, on the way home from Womerah Avenue, (Darlo School), the boys and girls would play hide and seek in the grounds of the Scottish Hospital. Sometimes when someone was extra hard to find, I would be informed by the more knowledgeable R.P. that “It’s no good looking for R.M. He is up E.D.” Even at that tender age, I understood the message and made due allowance for juvenile research. This research, which I am sure was purely academic, could not have led to any ill-consequences. Eight or nine-year olds do not get Ph.D.s or babies. Not all of the residents of Paddington were all as pure in their research. Some adults, accused of selfish and forceful knowledge of those matters relating to the young, disappeared from the social scene. That Niminski boy – he was a boy then, might be older than me now – looks it anyway – I saw him in the street. At least he was in the street and I was in the tram – which was a good thing because once I borrowed his bicycle and because his old man made those smelly cigars(1), he could, or his old man could, afford one. Now that you have a bike of your own it has all come back to me. I borrowed my first ride from Andrew but he didn’t know and when I returned the bike he didn’t know even then. I did hear he was looking for a bike beginner with abrasions. As I was going to school in knickerbockers at the time he never found him. I still don’t know, that after all these thirty odd years I should not have been bold enough to whistle to him from my seat in a fast going Dulwich Hill tram. You Peter N, were named after Nathaniel, a god fearing great-great-grandfather of yours. Seeing as I am somewhat of a toss-pot like Nathaniel’s father Richard, I thought it well to remind you of my sins of the flesh by incorporating ineradicably in your name a reminder of righteous reaction against the wilfulness of self-indulgence. Your forebear removed way back along the ladder to Adam, was a very notable character. So much so, that the Australian Dictionary of Biography asked me to do an itsy-bitsy piece about his life and works. Knowing that you won’t read useful knowledge I will thunder out that he came to Sydney from County Wexford, Ireland and landed here in May 1841 with related family expatriates. Sixteen, including himself, had started off, but poor old Richard had not survived the voyage, and was buried at sea. Now Nathaniel was not only a very strict Methodist and lay preacher, he was a damn good carpenter and did quite well in the Maitland district. About 1850, he really got with the sermons and in 1861 became ordained as an Independent Methodist minister, with a power to solemnize marriages. “If Satan ever appeared as an angel of light, and in the shape of a woman, it was in the person of Mrs. H.. So polished a hypocrite, I have never met. She was the wife of the master of a vessel, which sailed out of the harbour; had a fine personal appearance, and polished manners. She had been living with a man, who was not her husband. A pious woman found it out, and spoke to her, and brought her to the meetings, which I conducted. She left the man, and after some time her husband took her again, and they lived together. He often accompanied her to the chapels. She soon began to profess religion, and possessed a fine gift for prayer, and gained the esteem of many of God’s people; but a married man, who was brought to God in affliction, and who had been very wicked, fell a victim to her wiles. She spread a net for his feet, in which he became entangled. He first commenced to see her home from the meetings, and after a little, it was found out that there was something wrong between them, but it soon proved to be a certainty. When I challenged her about it, she dropped on her knees, and with uplifted hands and falling tears, in the presence of God declared her innocence. They were both turned out of society. She still continued to attend the chapels, and some believed she was hardly dealt with. One man of long standing in the church, and a public teacher was of the number, he visited at her house and kept her company, until he fell into the same deep ditch as the other. He too was expelled the church, and the cause of much scandal to religion: both these men were married; but this was not all. A minister of a Christian church was so infatuated with her, that he took her to be his house-keeper in the country, and soon after brought great scandal on the cause of God. Old Nathaniel was good enough for his flock to build him a substantial church on a corner of Sussex and Liverpool Streets. It still exists but is without the sanctity of hosannas, alleluia’s and hallelujahs – it reverberates now only to the bangings and swearings which go with garages – ex churches. Note: Nathaniel’s church on the southeast corner of Sussex and Liverpool Streets, Sydney no longer exists today; replaced by a high-rise building containing commercial retail outlets and serviced apartments. You, Graham R. were named after your great-great-great grandfather Richard P because he seemed to me to be something of a real broth of a bhoy – very left of the extreme right in his excesses. He was of all things, a Loyalist Protestant living in County Wexford during the days of the 1798 Rebellion. A yeoman in Ogle’s Loyal Blues he took his loyalties to his heart without question as this account by his son Nathaniel testifies. “My father, at this period was a great loyalist – fond of company, and possessing an undaunted mind, was often led astray, and sometimes got into difficulties. In Ireland about this period, no Protestant was safe; Government had issued orders to have the leaders of the rebels seized and executed. Many individuals were sent to New South Wales. One of this class, named McDonald, being in a public house near Ferry Carrig Bridge, my father and uncle Foley, while passing the same (house) at night, on looking in, saw McDonald and determined to make him a prisoner, although surrounded by many of his friends. My father stepped into the room where he was, drew his sword, ordered him to rise, adding that he was the King’s prisoner. Some of his companions rose to take his part upon which my father struck the mantel piece with his sword, saying – the first man that moves from his seat, or offers resistance, shall take the consequences. He brought his prisoner out from amongst them, led him along two miles of a lonely road and lodged him in the gaol. The act of committal being informal, the prisoner was discharged, and my father confined for a period of three months for false imprisonment. Great-great-grandpa Nathaniel also records that his dear old dad and his brother Henry were Church of England and were stationed at Dungannon during the insurrection. Uncle Henry went off to the fight the wars in Europe, and Richard returned to Bellevue to marry Elizabeth Foley of Baladicken. Sometime after this a relative named Evans, who lived at Newton Barry, sold his property and went to America. He returned, chartered a ship, and offered Richard and his family a free passage to America and a farm in Ohio. “My mother however would not consent” reports Nathaniel. But how do we know other Pidgeons didn’t accept this offer and progenerate Walter Pidgeon the actor? How else should I always be called Walter (after the actor) when I’m really only William? Strangely enough, after this bit of conservatism on Elizabeth Foley Pidgeon’s part they allowed themselves to converted by an itinerant preacher, Mr Bulger, to the Wesleyan Methodist faith. All this conversion stuck and much later at a revivalist meeting, Nathaniel met and later married Miss Eliza Proud whose old granddaddy had looked after John Wesley during his visit to Ireland. Note: Walter Pidgeon’s family line extends back into Canada in the 1700s. There is no known family connection. This is dedicated to two small boys and all the terrifying real people who used to live around the Five Ways. If some of the people mentioned are not as real as they should be – it is mostly my fault. I hope I have caused no offence to any one I may have mentioned – through the vapourising of the past they were all helpful in bringing me down to what I am today. What do you do when you come back? Upsweep the old linoleum? Waste untold hours over the underlays of newspapers bespeaking of the relief of Mafeking or of Bill Lowes £3 suits – the identical to which he always wore to Randwick and exulted places. It all gets as screwy and symmetrical as a Rorshach blot. An accident of happening into which you read what you will or wish. A vortex wherein everything is valid – heliotrope or mid-brown paint – moss or rubber plants – white ants or quarry tiles. Expensively reconstructed pull bell systems or rich men’s electronic sifters of the knocker at the door. Of peeling plaster or blasted sand-stone brick – of a garage where the drawing-room was or a motor bike in the hall? Of the fly door butcher or the bulk meat purveyor? Of the horses pooh collector or the distributors of filth into lanes and alleyways. Of neighbourliness or even of a quorum let alone a collection of devotees of St Georges Church? Not even good old operatic killings. There’s a haze of culture and the pensioners manage to get the Labor boys re-elected. The fish and chip shop is strangled by take-away pancakaries and quicharies and pizza plazas. Children have nowhere to play in Glenmore Rd School. After hours offers them safety from the traffic. The elegant potters vie with antique shops which trade in boarding-house has-beens. The old pub you should not have been seen alive in is classified A1 by the Trust. The Paddington Society who made the realty values cannot raise enough for a home. Pubs are full of exotic grogs for the dine-at-homers while serving a one beer choice to the old and steady. Mercedes and Jags clutter the Art Gallery tiny lanes while bombs are dumped in noble streets. You can buy a sandwich at one joint for 50c. and a counter lunch big enough for two at another for 60. It’s all getting too bloody democratic?